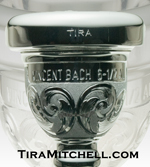 Tira Mitchell started Engraver.com in 1996. Originally dedicated to Tira Mitchell’s Custom Engraving, Engraver.com now offers some of the newest, most innovative hand engraving tools for jewelers, hand engravers and stone setters in the world. Tira’s personal engraving services can now be found at TiraMitchell.com. Along with introducing innovative EnSet tools to the U.S. market and selling them worldwide, Tira introduced the hand engraving and jewelry industries to the Leica A60-F microscope. Tired of using microscopes that were fuzzy on the edges and required constant fuss to keep centered and in focus, Tira extensively researched the microscope market to find a scope that works for hand engravers and jewelers. She discovered the Leica A60-F, which at the time was being exclusively marketed to the electronics industry. Since beginning to market it in 2012, this microscope has become the industry standard. The engraving tools sold through Engraver.com are tools Tira uses. They are high quality, reliable, time-saving tools that help people engrave and set stones faster. Engraver.com also offers training to help people through the hand engraving learning curve. Tira and other world-class engravers offer different ways of mastering tools, techniques and tips that improve the quality of engraving and save time to help make engravers more productive. Tira has been engraving, teaching and demonstrating for over 20 years. For more information about Tira and her background, please visit her personal site, TiraMitchell.com. Also consider subscribing to our FaceBook page by clicking the FaceBook icon below. Engraver.com, TiraMitchell.com, and Tira Mitchell Custom Engraving are all owned and operated by Precision Artistry, LLC.